Layer one half of the potatoes on the bottom, in a small casserole dish (I used a 9 inch glass pie plate). 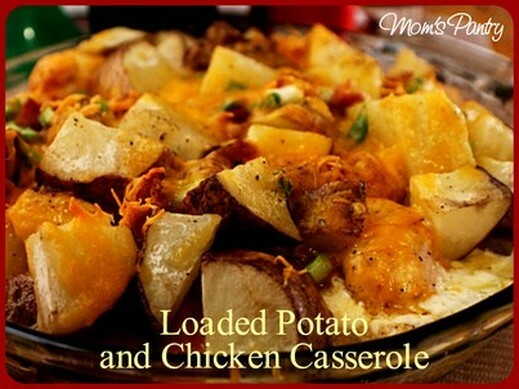 Place the diced chicken pieces on top of the potatoes. Sprinkle 1/2 of the crumbled bacon on top, 1/2 of the shredded cheese and 1/2 of the chopped onions. Add a final layer of potatoes, bacon crumbles, diced green onions and shredded cheese. Sprinkle lightly with salt and pepper. Pour 1/2 cup heavy cream over the top and dot with butter pieces. Bake covered with foil for 1 hour at 350°F. Remove foil and return to 350F oven for another 30 minutes, or until potatoes are fork tender.